The Birkenstock Mayari toe-alignment sandal boasts a svelte appearance that is further accentuated by a fine and slender patent-look strap. Each of the two straps above the instep features a contrasting metal buckle that enables them to be adjusted to the wearer’s feet. The additional loop around the big toe is directly attached to the shaft for firm grip and a good fit. For the mountain life lived off the trail, we’ve got you covered. The low-profile Dorra features full-grain leather straps in familiar Chaco design language, finished with a gore-inset toe loop for additional forefoot control. Pigskin lining adds instant comfort to the Dorra, while embroidered graphics adorn the burnished leather top sheet for a casual, yet elegant option for any occasion. Featuring the all-day support and comfort of our slimmed-down LUVSEAT™ PU footbed for a lifestyle sandal that feels as great as it looks. The Giovanna is a feminine slip-on sandal with rivet accents. 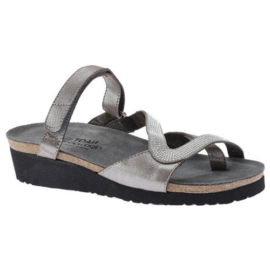 This style features a hook & loop strap at the instep with added gore for adjustability. The Giovanna has a toe loop to help hold the foot in place when walking. Naot’s anatomic cork & latex footbed is wrapped in a pampering suede and molds to the shape of the foot with wear. 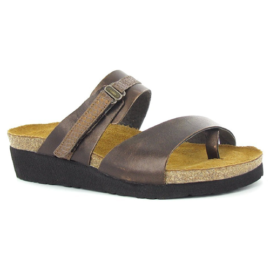 The Naot Jessica is a slide sandal with a hook & loop strap at the instep. This style has a toe loop which helps holds the foot in place when walking. Naot’s anatomic cork & latex footbed is wrapped in a pampering suede and molds to the shape of the foot with wear. 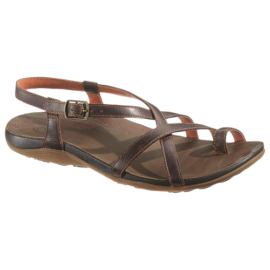 Add tread to trend with the ‘Upena, a multi-strap leather sandal with a textured rubber outsole. Adjustable ankle strap with antiqued metal buckle for a customized fit. Slotted leather toe post with a comfortable bonded construction.